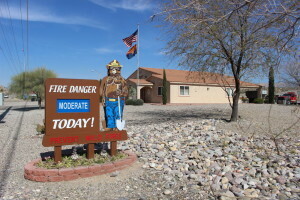 LITTLEFIELD, Ariz. – Fire crews with the Beaver Dam-Littlefield Fire District were kept busy overnight as they dealt with a brush fire by the Virgin River Friday night, then a to a structure fire a few hours later early Saturday morning. Around 4 a.m., Saturday, the fire district received a report of a structure fire in Littlefield, Arizona, located at the end of Desert Springs Road. The call, dispatched through Mesquite Police, related that the occupants had evacuated the structure, yet there were still possible pets inside, Beaver Dam-Little Field Fire Chief Jeff Hunt said. Upon their arrival to the scene, Hunt said, the structure, which had either been a single-wide, or double-wide trailer home, was “fully engulfed” in flames. Authorities said the occupants of the home were nowhere on scene when they arrived. 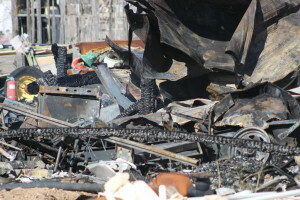 The surrounding property also consisted of what appeared to be a residential dwelling and other trailers. Thought firefighters were able to keep the fire from spreading beyond the one home at the one structure, it burnt to the ground. “It was a complete and total loss,” Hunt said, and estimated damages to be somewhere between $17,000 and $20,000. Two firetrucks, two water tenders, and two ambulances responded to the scene, Hunt said. A fire crew from the Mesquite Fire Department also responded. Getting to the fire posed somewhat of a challenge for fire crews, Hunt said, as the property is located at the end of a very narrow strip of rocky road. The fire was knocked down by 7 a.m. It is unknown if any pets reportedly left in the trailer home were able to escape the blaze, Hunt said. No injuries were reported in connection with the fire. The cause is currently unknown. Prior to the structure fire, fire crews were sent to a brush fire around 9 p.m., Friday, in an area called “Little Jamaica,” where the Beaver Dam Wash connects with the Virgin River. 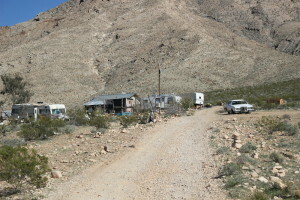 The area is near the Interstate 15 Exit 9 into Littlefield, on the west side of the highway. “It was actively burning in the trees and brush next to the river,” Fire Capt. Damon Jackson said. The size of the fire was about 150 feet by 150 feet, he said. The fire was contained and fire crews wrapped up operations by 12 a.m., Jackson said, though added, he and another firefighter were going back to the area Saturday afternoon to check for any lingering hotspots. A fire tender – a fire unit that carries extra water for the truck to draw from – was put on standby at the fire station in Littlefield. It ultimately wasn’t needed as firefighters were able to draw from the river. The cause of the brush fire is also unknown at this time. St. George News reporter Ric Wayman contributed to this story. I can always count on St George News to use words I have to google, like quell.